Course Website: Official Website - Visit True Blue Golf Club's official website by clicking on the link provided. 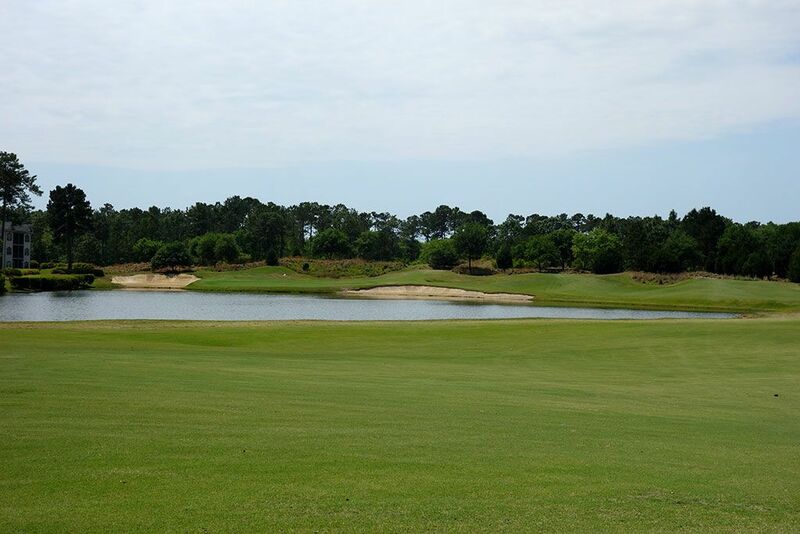 Accolades: Ranked 4th in South Carolina on Golf Course Gurus' Best in State list. 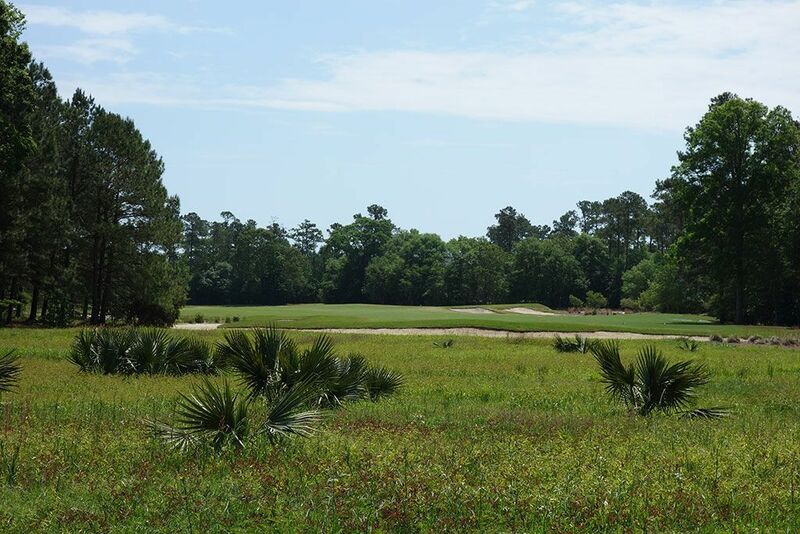 What to Expect: One of just nine Mike Stranz signature courses in the world, True Blue is one of the most creative golf courses you'll ever play and certainly one of the most artistic. Fairways, bunkers, and greens feature sweeping edges that rise and fall as if Stranz used his brush stroke to shape the terrain. Unless you've played other Stranz courses, you've likely never encountered greens like this before with some of the most unique shapes and sizes in the country. Unlike many other modern architects that rely on lumpy undulations throughout the green to create a putting challenge, Stranz puts in lengthy tilts in his putting surfaces and demands players to properly judge the slope and speed for longer distances. Players with eremikophobia will want to steer clear of True Blue since sand is found on every single hole on the property and boasts some of the most penal shots you'll ever face from those areas. The starter will let you know that their aren't any bunkers on the course and that all of the sand plays as a waste area where you can ground your club and even drive your cart through. The result is some hardpan lies that can be very difficult to get clean contact from if you aren't accustomed to hitting off surfaces that simulate your driveway. 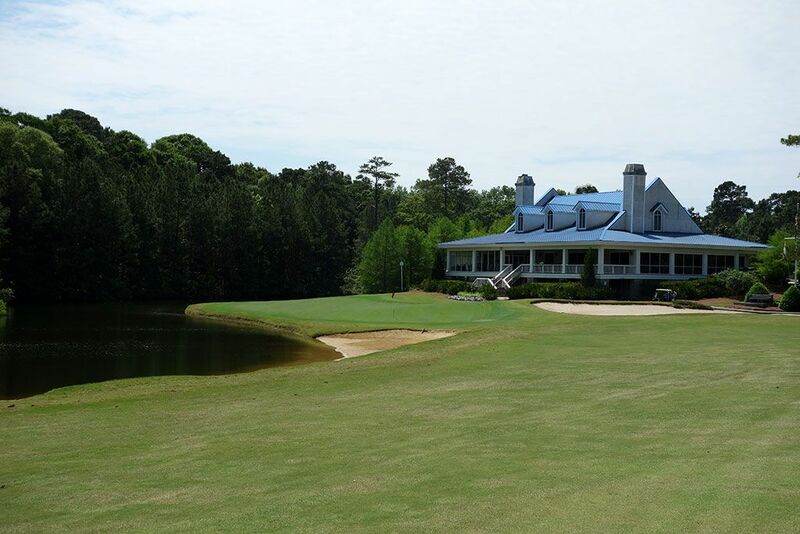 The course features doglegs on virtually every non-par three hole, so snagging a yardage book in the pro shop is almost a necessity to properly manage your game. 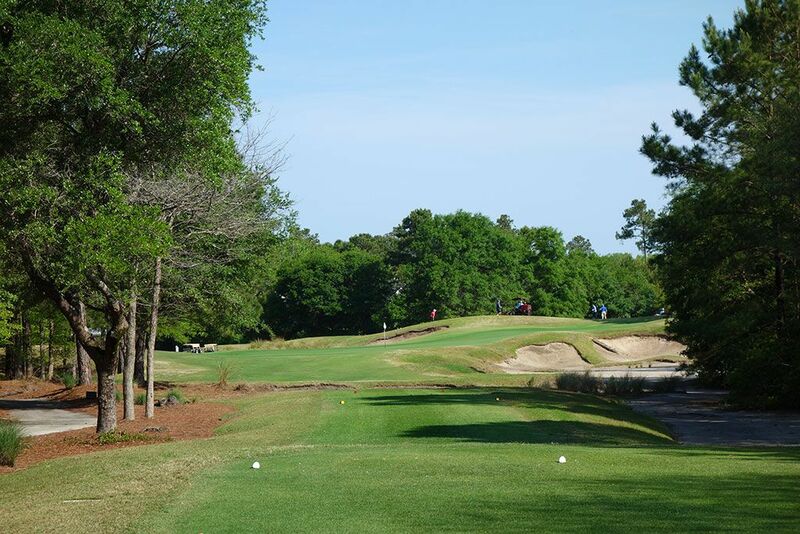 The course is seeded in bermuda grass which is cut short and thus boasts very tight lies that can run great distances, especially since there really isn't any rough to flow it down. Conditioning isn't True Blue's strong suit but isn't a large enough concern to consider not playing here. 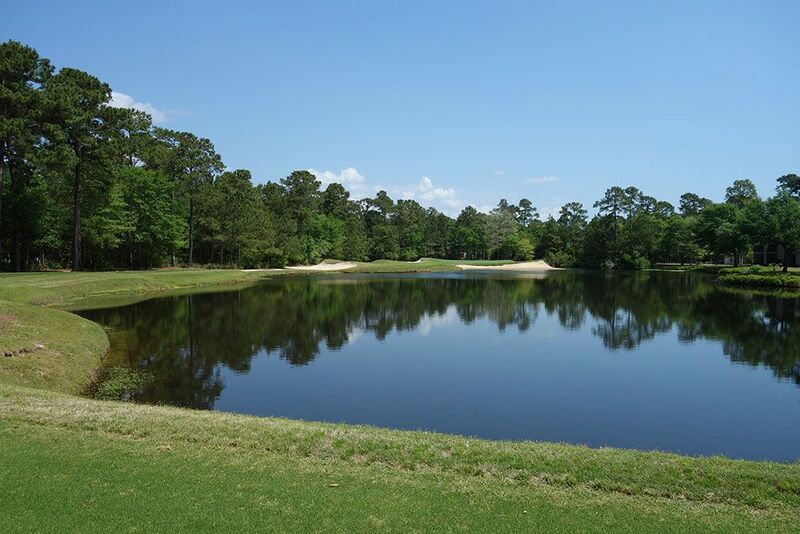 From the tips this course stretches over 7100 yards and is more difficult than it may appear considering trees line every fairway, sand is in excess, and due to the water hazards found on various holes. 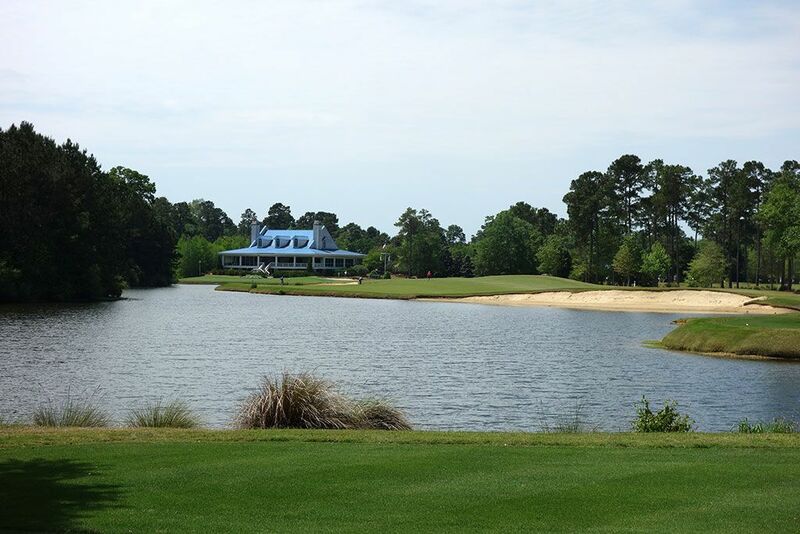 Without a doubt, True Blue is one of the most memorable courses on Myrtle Beach's famed Grand Strand. 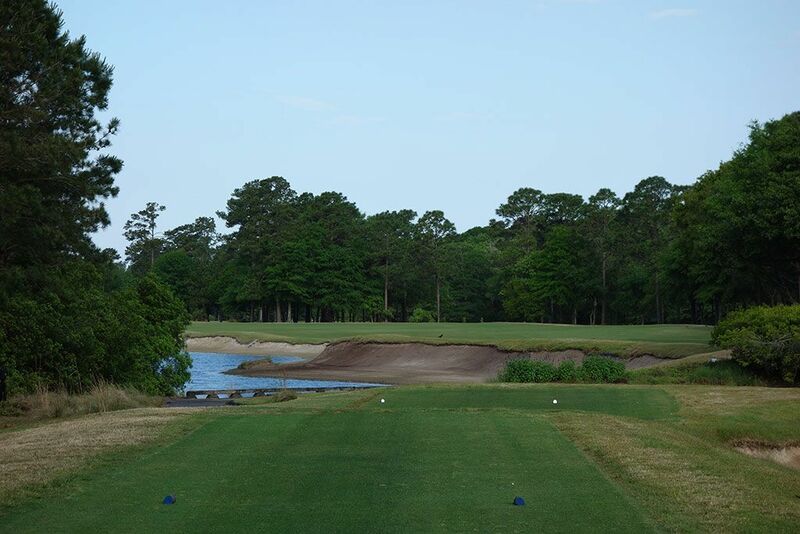 Signature Hole: 3rd Hole – 190 Yard Par 3 – You might mistake this hole for a tropical paradise. With an island green, trees in the background, and a white sand bunker posing as a beach, it is almost like something you'd see in a movie. It is a do or die hole, but the hourglass green is large enough to provide plenty of safety out there for you. With the green angled from front right to back left, club selection is critical to hit the correction portion of the putting surface. Strantz' imagination and artistry is on full display here. Best Par 3: 16th Hole – 208 Yards – This hole looks as if Strantz painted it on a canvas. 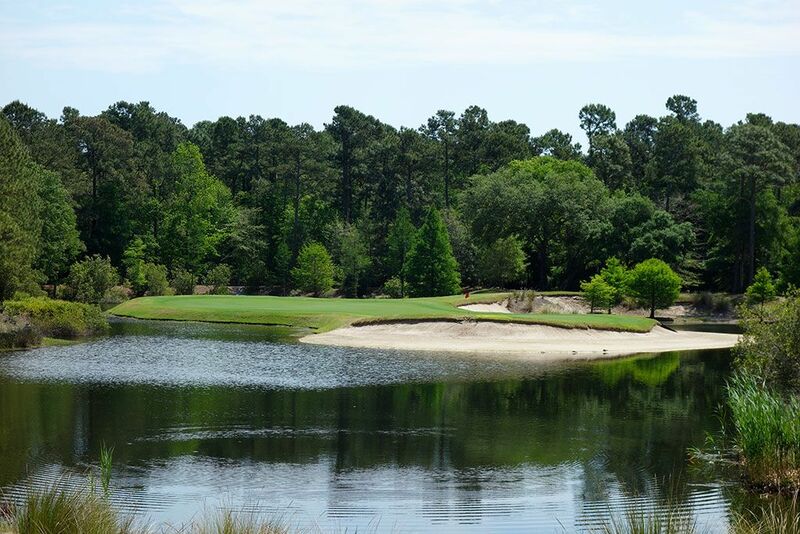 The sweeping bunker and green lines are artistic while the water provides an impressive color and texture contrast. The green slopes from left to right which is additional reason to aim left and avoid the water that protects the entire right side. Players that aren't confident attacking the green are afforded a generous layup area short of the green and can be a smart play, especially when the wind is whipping. The par threes at True Blue are flat out awesome, and this hole is a great example of why. Best Par 4: 18th Hole – 437 Yards – The name True Blue seems especially appropriate on the closing hole that features blue water up the left side and the blue clubhouse as the focal point in the background. 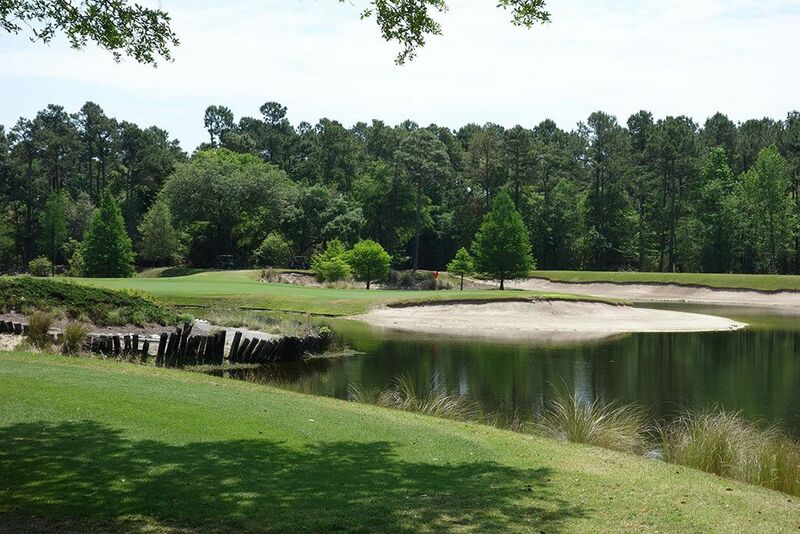 Strantz requires players to stay focused all the way down the stretch as they tackle this closing hole that features water on the left and sand flanking the right. 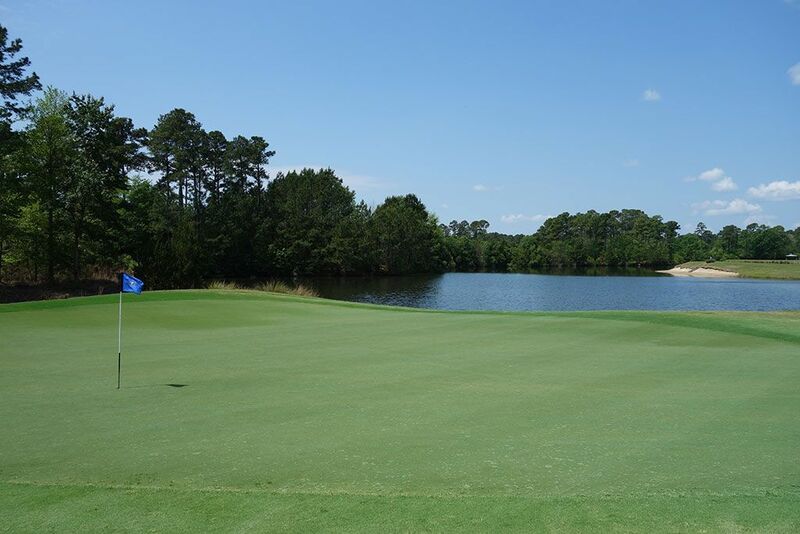 The green slopes towards the water so players may need to dial back their aggressiveness when attacking the pin to ensure safety heading into the putting surface. Best Par 5: 4th Hole – 548 Yards – This cape hole presents a great risk/reward opportunity that could lead to a birdie, or possibly an eagle. A tee shot that hugs the left side of the fairway near the water hazard will be left with just over 200 yards to reach the green if taking a straight shot over the water. The green slopes right to left which should be taken into consideration on the approach shot in order to best set up the next shot. Anyone that isn't confident in carrying the water on the second shot can continue working around the cape and make it a three shot hole. 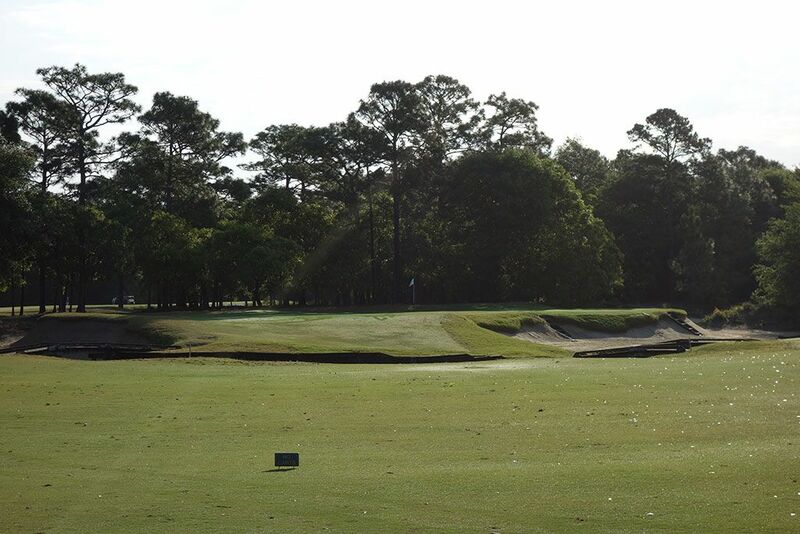 Regardless of your strategy, the pot bunker to the right of the green must be avoided to prevent having to face one of the most treacherous shots on the course. Birdie Time: 7th Hole – 176 Yard Par 3 – Yet another great one-shotter, this hole presents a nice birdie opportunity considering how large of a landing area you have to work with. With the pin on the left, any tee shot on the left half of the green or anywhere on the slope transitioning to the upper tier will work the ball towards the hole. With no driveable par fours at True Blue and challenging par fives, this is as good of a time as any to try and take a stroke back from old man par. Bogey Beware: 1st Hole – 624 Yard Par 5 – Mike Strantz doesn't give players much of a warm up as he throws this 624 yard beast at you right off the bat. Sand flanks both sides of the fairway the entire length of the hole and a creek fronts the green which has to be carried on the third shot. The green is relatively narrow which makes the approach shot all the more demanding, especially with a bunker wrapping around much of the putting surface. It is rare to have the #1 handicap on the opening hole, but this brute deserves its ranking.